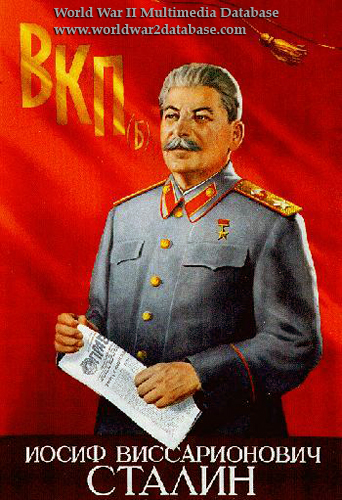 Soviet Premier Josef Vissarionovich Stalin (December 18, 1878 - March 5, 1953) appears in a post-war Soviet Poster. The text reads: "VKA(b) Josef Vissarionovich Stalin." VKA(b) stood for Vsesoyuznaya Kommunisticheskaya Partiya Bolshevikov ("All-Union Communist Party Bolsheviks") the traditional Russian name for the Communist Party. Stalin, who accepted the title of Generalissimo on June 27, 1945, wears the star of "Hero of the Soviet Union" which he was awarded twice, in 1944 and 1945. He carries the newspaper Pravda ("Truth"), the Communist Party organ. Stalin and his supporters suppressed knowledge of his mistakes in the early days of the war, and diminished the accomplishments of the Marshals and Generals. This poster is typical of the cult of personality he created after the war that called on Soviet citizens to acknowledge him as the savior of not only the Soviet Union but the world. Stalin's postwar image makers claimed he foresaw the German invasion in the 1930s and industrialized the Soviet Union to meet the Fascist threat. Contributions of Great Britain and the United States were downplayed after 1945; at first, they were simply ignored, later they were cast as woefully ignorant of the Soviet Union's massive sacrifice to stop the Nazis. Using imagery like this and suppressing alternative views (such as limiting Red Army officers' postwar memoirs), they converted a population from expecting an end to wartime sacrifices to accepting continued famine and shortages. The Soviet populace saw not only massive American aid (such as many Studebaker trucks and Chrysler jeeps) in the Soviet Union during the war but as the Red Army crossed Europe, a much higher standard of living for many people outside of Communist control. By focusing on Stalin's "genius" during the conflict, he forcibly distracted the Soviet people from the hard realities of the war and focused their attention on the future - and what they could do to benefit their nation and Comrade Stalin.